It's the Summer Solstice today and officially the first day of summer. Put it down to the warm weather here and perhaps that famous white Givenchy Wedding Dress, but I felt the need to buy something white to greet the season with. This really pretty white Off-The-Shoulder Blouse, from H&M's Divided range, appealed to me immediately. 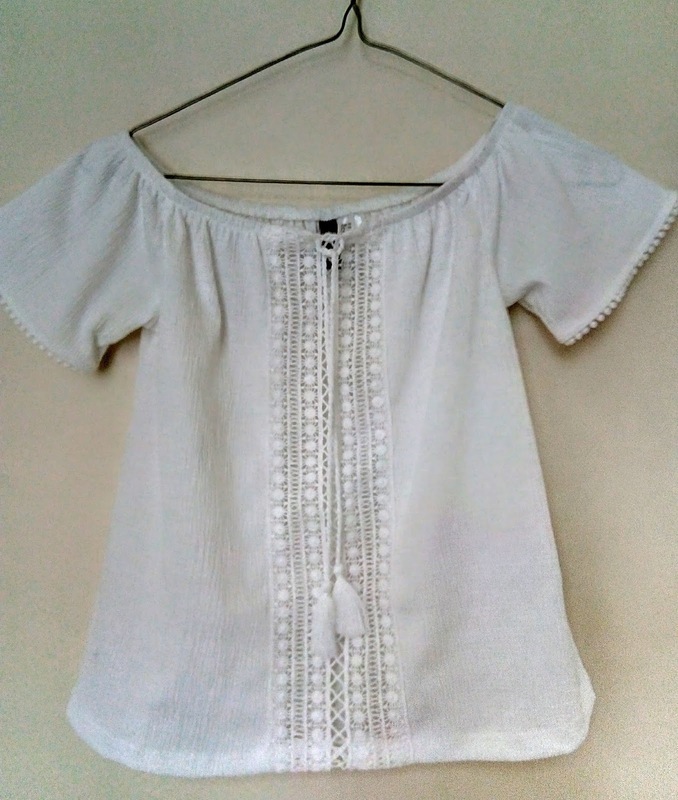 Made in a woven fabric with a lace panel down the front, it has short sleeves and a tasselled drawstring. LINGERIE TIP: For those of us who need some firm support under off-the-shoulder tops, H&M do some good strapless balconette style bras. I bought a powder pink lace strapless bra (it came in a "2 pack" with a handy black one!). Under fine white materials, to avoid white patches showing through, I would recommend a skin-toned bra rather than a white one. Another essential for me was a new pair of sandals. OFFICE is one of my favourite places for finding shoes that are both stylish and comfortable. These soft, gold leather, T-Bar, Footbed sandals are called "Sorbet". No doubt, the gold shoes and boots featured in Karl Lagerfeld's CHANEL Autumn/Winter 2018/19 Collection inspired me to think about gold shoes. 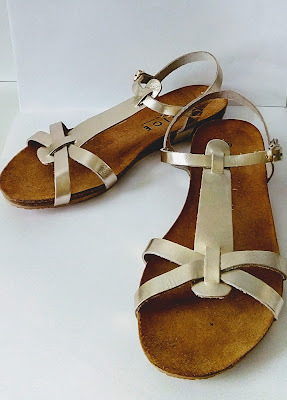 I know that sandals aren't exactly an Autumnal style but I'm sure that I will wear them throughout the summer and on into those first warmer days of early Autumn. Now, the sun is out and hot weather is forecast for the foreseeable future.